Way above average giant insect thriller, mainly due to the awesome special effects of Willis O'Brien ("King Kong" - 1933). Three set-pieces are superb: the first appearance, rather unexpectedly, of heroine Mara Corday talking to telephone linemen, who soon are under attack, then the train wreck which is terrifying and bizarre, and the final confrontation in the stadium, featuring grand editing and surprising touches. Mexico setting works well, music and sound effects are exemplary, sub-Earth sequence featuring more creatures is eerie. Title refers to the largest creature in the climax, budgetary limitations revealing a black traveling matte, still mystical, with fascinating zoom-in camera shots. 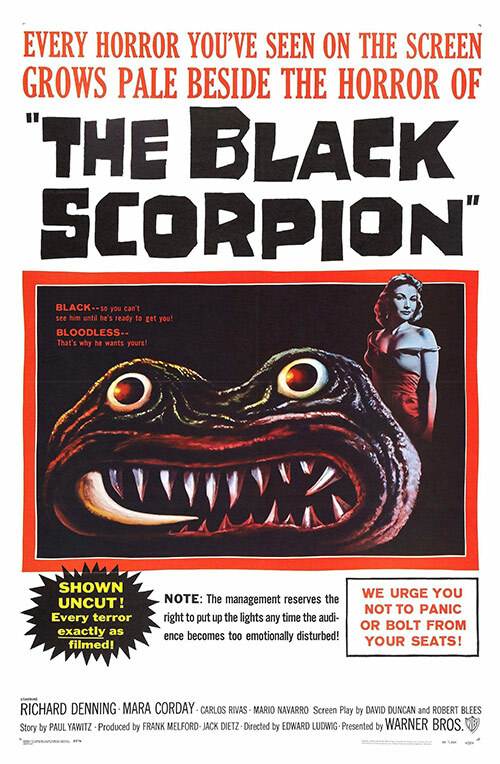 1 Response to "The Black Scorpion (1957) Edward Ludwig"